From start to finish CUE 2010 was outstanding! Question 1: What does it mean to be a friend in 2010? How do we encourage kids to be cyber citizens – who care about each other. WE have a lot of work to do. We have to help students create a new social culture where children become each others keepers. Larry referenced a Palo Alto high school that has had a rash of teen suicides. According to the National Suicide Prevention Lifeline, kids who commit suicide often put out warning signs. Fellow kids are the most likely to see those warning signs. But we seem to have this mentality to not respond. Question 2: What does it mean to turn our children into agents of social betterment? Rebecca Randall of Common Sense Media – There needs to be more of a home-school connection. Kids are leaving digital footprints, but they don’t really have the brain development to understand the consequences of their actions. Kids need to warn their friends that they’re posting something inappropriate. As educators, we need to do things pro-actively and build a culture of responsibility – a “culture of dignity.” It’s not just about doing no harm, but about doing good. Education by far has worst instances of malware – access to hacked URLs is 6X worse in education than all other organizations. Information software stealing is 4x worse in education. Disturbing statistic: 10% of ID theft = child identity theft. The technique of “social engineering” is on the rise. For example, with any current event, such as the death of Michael Jackson or the Winter Olympics, criminals will rush to web and try to plant themselves wherever they think kids will be – but it’s really a hack link. They’ll make offers to children, which require downloading something to view whatever the offer is. Kids are often opening pop-up for codecs – that will log all keystrokes and send that information back to somebody. Teaching students about the security side of the Internet should be an essential component of our media literacy programs. Kids don’t like being manipulated. After watching some of the Internet Security 101 tutorials, students will realize that downloading a cool movie, for instance, could result in loss to their privacy. Our Internet safety programs should promote the process of critical thinking. Note: March 16 Trend Micro – will launch Internet safety video conference. Will definitely be checking their site for this event! The questions I will be revisiting on a regular basis, sharing with teachers and parents, and weaving into my Internet safety workshops are What does it mean to be a friend in 2010? and How do we create a culture of dignity? This week I am determined to join some of the final sessions scheduled for the 2009 K12 Online Conference – Bridging the Divide. I visited the site this morning to check the schedule and that’s when I discovered the link to the Digiteens Global Project , another inspiring project facilitated by the ever-inspiring Vicki Davis. As part of the k12 online conference 2009 and as a conclusion to the Digiteen Project #3 of 2009, students from Westwood Schools will be presenting their top socially connected sites for kids aged 8-12 (and some that they DO NOT recommend.) As part of Digiteen 2009, these students felt that many sites that are marketed to kids aged 8-12 are not appropriate nor safe and set out to review and test the best. They have been blogging and have a twitter account (@socialsafety) and will be presenting live in Elluminate on Wednesday, December 16, 2010 from 12:15 pm-12:45 pm and answer your questions about their testing experiences. Checkout the Internet Safety Video Contest! Thanks to much support from my district (especially Tech Services and Communications) and a partnership with the US Attorney’s Office, my 2WebWatchers partner, Kathleen Watt, and I were able to spend the December 16 School Board meeting recognizing a group of students for their entries in our First Annual Internet Safety Video Contest. The winning entries and honorable mentions are uploaded and posted, so check it out! If you are considering putting together a similar event for your school district, I encourage you in your efforts and invite you to contact me with questions and suggestions. You are also very welcome to adapt our contest flier, entry form, and guidelines (posted on 2WebWatchers) to suite your event. We tailored the guidelines to meet SEVA 2009 guidelines. Based on this year’s event, we’ll tweak next year’s entry form to include the sponsoring teachers’ names – but still allow, even encourage, entries from independent filmmakers such as the talented, dedicated Tori W. (who has moved from 8th grade to 9th, still without being able to enroll in a video production class). We’ll also require a typed list of student names, rather than attempting to decipher names from handwritten entries. And the last tweak will be the requirement that all videos are submitted as a CD so that we can easily pull snippets for an Awards Night montage – unless we can find a software program that makes working with DVDs less of a hassle. If you already have a similar event in place or know of other districts that are sponsoring Internet safety video contests, I would love to include your links on 2WebWatchers! This post is in response to Anne Mirtschin‘s request for cybersafety resources for students. I’m currently out of the classroom, but for the past two years I’ve been teaming with our district webmaster to provide Internet safety workshops for teachers and administrators, who during the course of the 2-hour session often swap their teacher hats for their parent hats. Fortunately, the resources for students, teachers, and parents are plentiful and growing. Here’s the opening slide from our PowerPoint. I like to start with the humor of the New Yorker cartoon*, quickly transitioning into the implications and realities of “On the Internet, nobody knows you’re a dog” by showing the Trevor’s Story video. I’ll be adding Anne’s post as an example of how an elementary teacher prepares students for safe travels across the information highway. i-Safe – Sponsored by the US Dept. of Justice, i-Safe offers free online training and certification as an iSafe instructor, parent, or mentor. It takes about 5 hours to complete the certification, after which you’ll be familiar with all the iSafe resources, including the classroom lesson resources they’ll send in hardcopy. iKeepSafe.org – Keep scrolling down the parent resource page and you’ll find excellent videos, including the What You Need to Know video. If I could direct parents to only one resource, it would be this video. It clearly explains the dangers of the Internet AND also makes a clear case for why Web 2.0 tools are important for 21st century students. Ideas for Integrating Internet Safety into the Curriculum – Kudos to the Virginia Department of Education for providing a model of how to align ideas for addressing Internet safety in the context of their state content standards for students. NetSmartz’ Real Life Stories -My favorite video is Broken Friendship. Spirit Desk’s Hero in the Hallway – This video is truly a K-12 resource. Scroll to the bottom of the page to find the video link. I really like the way the CTAP4 folks have organized resources for learning about and teaching all aspects of digital citizenship. They’ve included links to PowerPoints, workshop wikis, and even this wonderful poster. I think much of the credit for this valuable website goes to at&t’s Linda Uhrenholt. 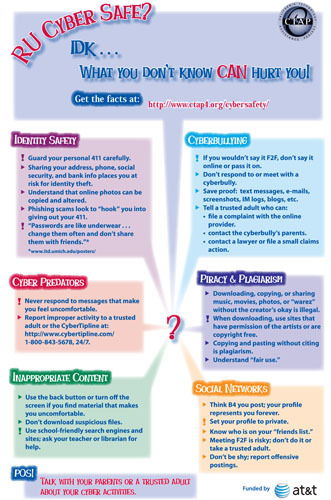 I also appreciate Doug Johnson’s sharing his Cyberbullying and How to Avoid It student guide and poster – and Nancy Willard’s willingness to allow him to incorporate information from her website. Doug will send the Word version to educators wanting to adapt the guide to meet their school or district’s guidelines. And for our elementary students, I like McGruff’s Shrink the Cyberbully activity. OK, in appreciation of all who are contributing resources to promote digital citizenship, I have one to give. Many of the teachers and administrators attending my iSafety workshop ask for additional explanations of some the terminology that comes with Web 2.0. I’ve been working with our district webmaster, who co-teaches the iSafety workshop, on developing a Cyberspace Glossary. I can send the Word version to anyone who wants to tailor it for their own site. For the last few days, a very sad story about educator Kathy Sierra has been moving across the blogosphere. A heinous story about threats made on her life, scary enough to cause her to cancel a keynote speech at a tech conference in California. In support and response, Andy Carvin has requested that today, March 30, all bloggers address cyberbullying in their posts. It is because of cyberbullying that we need to fight poorly thought through legislation such as DOPA. It is unlikely that many parents are aware of or prepared to help their children understand the depth, breadth, and danger of cyberbullying. In fact, the definition of “digital divide” has changed. It’s not about low income schools not having access to computers and technology anymore. The new “digital divide” is the gulf between how parents think their children are using computers and the reality of how they actually are. More than ever, we need iSafety and Cyberethics to be part of the school curriculum. Fortunately, there is a growing bank of good resources for educators and parents. I really like the selection available at Netzsmarts, complete with accompanying classroom activities. I also like Bill Beasley’s Cyberbullying.org and Nancy Willard’s Cyberbully.org – along with Nancy’s very complete white paper: An Educator’s Guide of Cyberbullying and Cyberthreats. Posts this week by Eric Hoefler, Andy Carvin, and Vicki Davis offer insightful thoughts and resources, including the newly created Stop Cyberbullying social network, annotated guidelines for stoppying cyberbullying, and cyberbullying badges. It’s a sad to think that one voice has been silenced, but also encouraging to see how quickly the Web 2.0 community is rallying to lend support and find solutions. I thank Wes Fryer for adding another layer to the rationale for including blogging as part our classroom curriculum. If our students can show parents how their involvement in purposeful, monitored classroom blogging is engaging them – safely – in the learning process, parent perceptions about Web 2.0 will change. Wes Fryer’s post follows last night’s outstanding Teachers Teaching Teachers session. Paul Allison emailed to a growing audience an invitation to join this weekly (usually) Skypecast for educators. His invitation included a link to Clarence Fisher’s post about dividing courses into components. Paul’s question to the TTT audience was “Do we need a separate class for blogging or is blogging an example of something that could be divided into components and re-assembled by a team of teachers at different times? “Wouldn’t it be smart for a school to take the set of skills and habits of work that blogging requires/inspires and teach these alongside other curricula, instead of teaching them in isolation like many of us do now in New Media/New Journalism/Computer Technology elective courses? What if the teachers and administrators in a school were to treat blogging as a basic skill that needed to be taught in every grade, every semester. Can we imagine a scope and sequence for blogging that would stretch across the grade levels? This is exactly what some of us are beginning to be able to envision. We are growing in our confidence to describe exactly what it means to teach blogging — and how it is different from what is taught now in even the best writing, media, and research classes. Those of us who have been teaching blogging as a course are beginning to be specific about what needs to be in a blogging curriculum. At the same time, many of us are not ready to go to the whole school and recommend this curriculum. We realize how much time, effort and thought must be devoted to blogging to see it become a truly meaningful and student-owned activity in school. I’ll end this post with one more argument for teaching blogging in the classroom: Pete O’Reilly’s post on child abuse and online predators.